Football Training - Strengthening The Core. 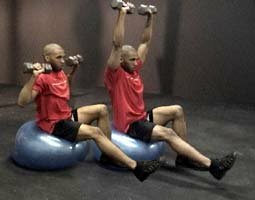 Most football strength and conditioning programs have some sort of core (abdominals, lower back, obliques) exercises. 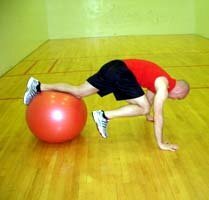 Most of the time the exercises are a waste of time and energy and can be better worked in a more functional way. By working the core in a more functional way, the athlete's risk of injury decreases, especially upper groin pulls. No matter how talented the athlete is, an injured athlete doesn't help the team or his/her own chance of success. Many programs have athletes perform crunches, bicycles and superman's for the lower back. This program isn't bad but it doesn't address the nature of the football. The crunch does not work the core through its entire range of motion. As with any football training program, an assessment of the sport is a must. Are the athlete's standing during competition? Do they change directions often? Does the athlete rotate during competition? How often are both feet on the ground at the same time? Once you have identified the movements of the sport, it is time to apply the movements to your training program. In football, each position varies in its movements during competition. Offensive linemen move both forward and backward and require a great deal of core stability to keep their balance. Backs and receivers make moves that twist their torso at different angles. Understand the nature of the movements is critical for a successful program. Most strength programs use at least one exercise for each muscle group in the body: bench press, row, shoulder press, bicep curl, tricep extension, squat, leg extension and leg curls. 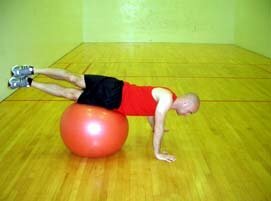 You can work the core on every single exercise mentioned above. The first tip is to perform each exercise on one foot or with one foot. By using only one foot, you force the core to stabilize and balance the body. 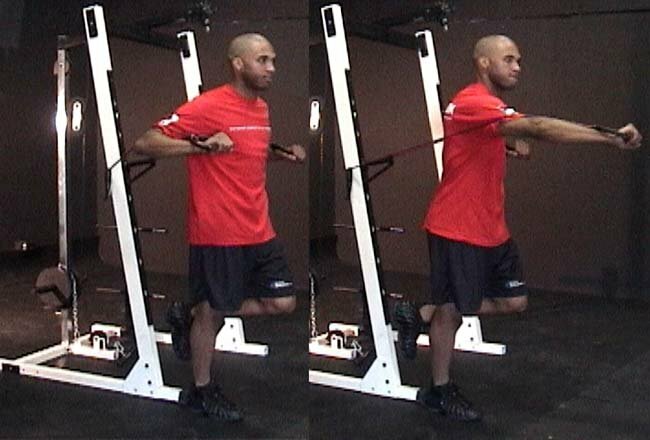 Bench Press On One Foot: To perform a bench press on one foot, all you need is a resistance band. 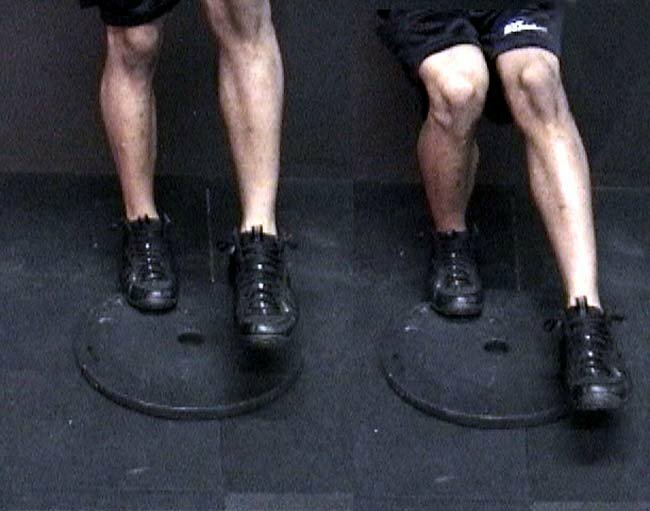 Standing on one foot with the band wrapped around a secure object, the athlete performs the bench press movement for half of the assigned repetitions and switches feet for the final half of repetitions. 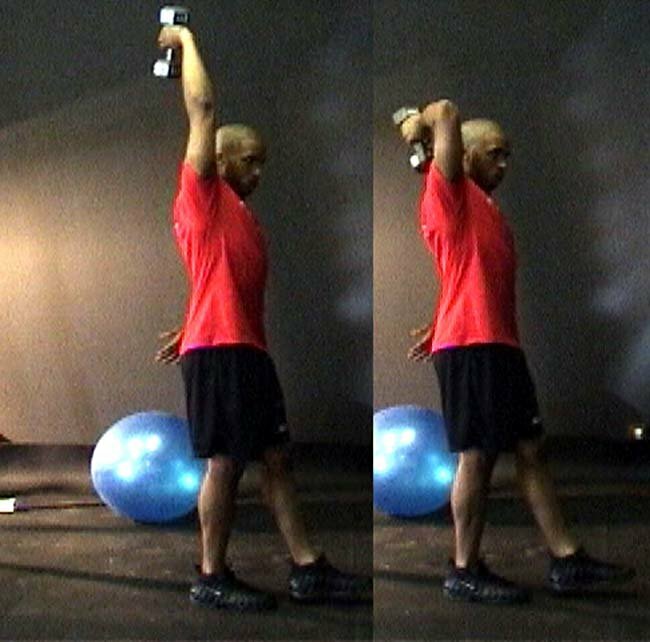 If the athlete has no trouble doing this movement, perform the presses alternating arms. 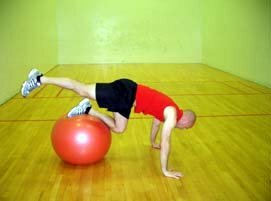 This shifts the center of balance and further focuses the core to stabilize the body. 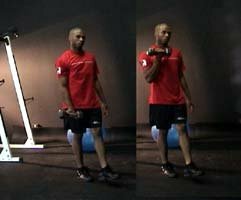 One Foot Dumbbell Bench Press: All upper body exercises can be done on one foot using the same progression for the bench press. Another alternative to this is a 1-foot dumbbell bench press on the stability ball. 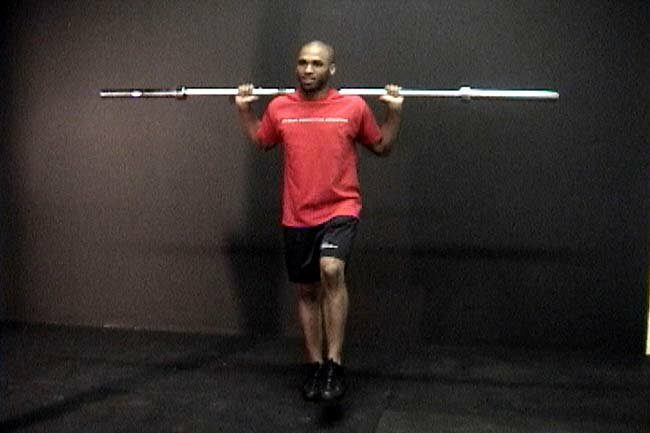 The progression is to use a 2-foot stance and move feet closer together while bench pressing. Once the feet are nearly together, alternating the arms challenges the core even more. Once this is mastered, it is time to extend one leg straight and perform a standard bench press. The progression is the same as before where the athlete would then alternate arms. 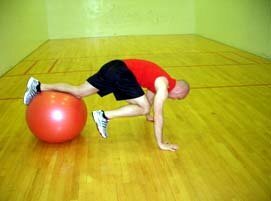 Once this is mastered, place the foot on top of a medicine ball or some other unstable object. If you master the unstable object, lift both feet off the ground and brag to your friends about your amazingly strong stomach! 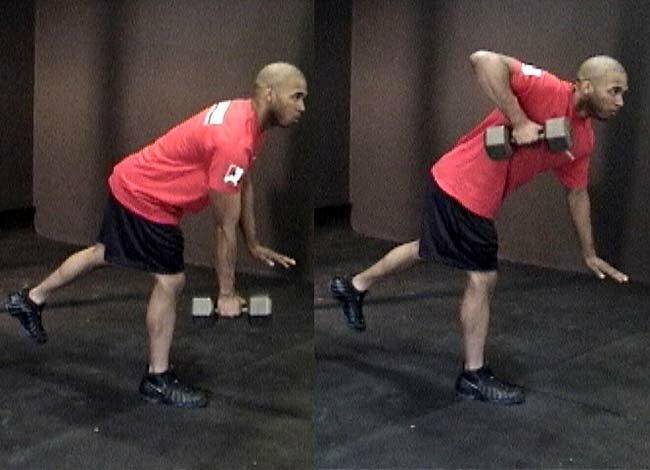 Dumbbell Row On One Leg: The dumbbell row can be performed in a similar fashion. 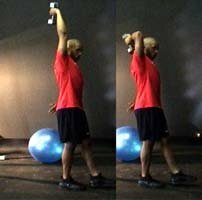 With one dumbbell in the right hand, extend your left leg so it forms a straight line with your back. 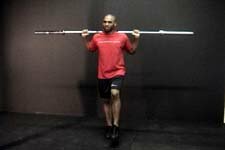 The first progression is to use the free arm to balance the body against a bench or rack. Once this is mastered, take the arm off and perform a bent over 1-arm row on one leg. 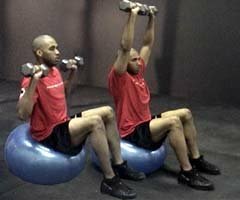 Shoulder Press On Stability Ball: A shoulder press on a stability ball is similar to the bench press. 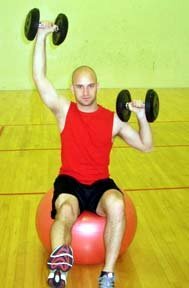 Sitting upright on top of the ball, hold both dumbbells in the starting position. The progression begins with both feet on the ground and gradually moving both feet together. The next progression is to lift one foot off the ground. 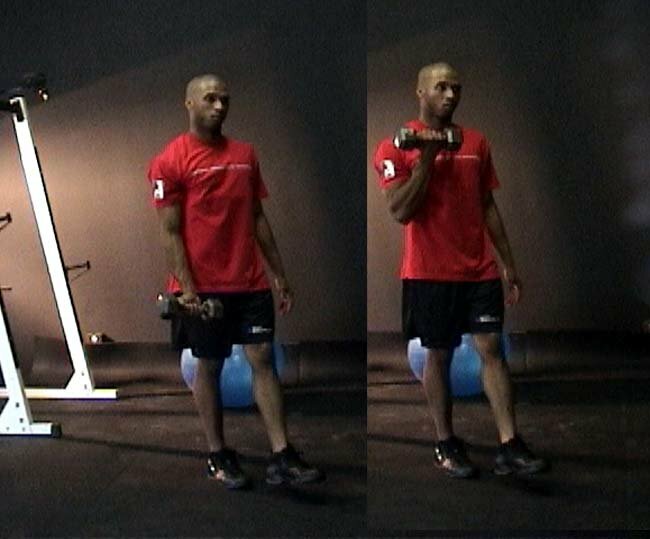 Use the same alternating arms progression in the bench press for the shoulder press as well. 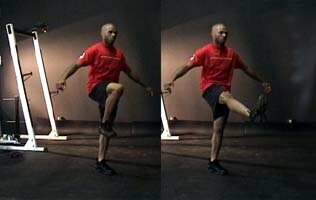 The lower body can easily use one foot training. Most athletes perform squats, lunges or leg presses. 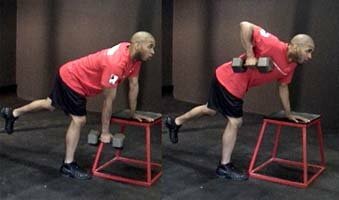 One-Legged Squat To make the athlete focus on the core and stabilizers in the hip, groin, and ankle more, perform a one-legged squat with the back foot on top of a bench. 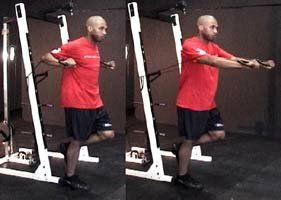 The next progression would be a 1-legged squat with the non-grounded leg behind the body. The last progression would be a one legged squat with the non-grounded leg in front of the body. 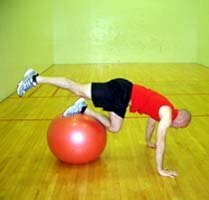 If these exercises are done with little difficulty, adding an unstable surface would be the next step. For most programs, athletes may perform 3 sets of 10 repetitions. By using the recommendations, the athlete also has done a total of 30 repetitions of core work per exercise. These exercises better simulate game movements and help strengthen the muscles involved. Injuries can not be eliminated by doing these movements but the movements can help reduce possible pulls and strains in practice and games. 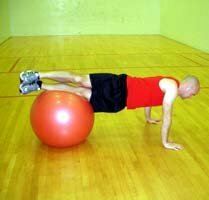 For those traditionalists, here are a few pictures of advanced versions to basic core exercises. These exercises work the core through a full range of motion. 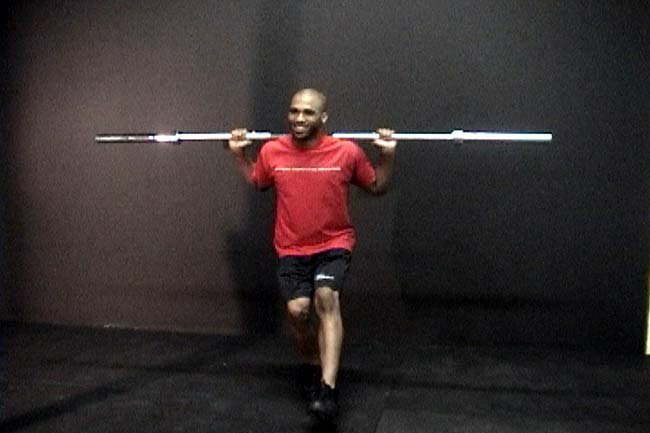 By using one leg, they also help strengthen the groin (an area to common for injury in football). Stability Ball Mountain Climbers: I call this 'Stability Ball Mountain Climbers.' This blasts the abs and arms. This is great for skilled positions. Linemen may have difficulty doing this one because of their body mass. Torso Twist This is a torso twist. The left picture is a beginner version. The ball is under the hips. To make the movement more difficult, move the ball out toward the ankles. Keep both arms straight when twisting the torso. The opposite arm will want to bend. Sport X Training was established in 2004 by Roger White. The training programs have to offer include all sports with ages ranging between 7 to prof.